If a cow produces forty-four litres of milk per day and its production suddenly drops to ‘a mere’ thirty-five litres, what is wrong with that cow? She is not ill, but also not in top condition. And if more cows show a milk production decrease of approx. 20% then there is an operating problem on the farm. Up until the seventies (20th century), the cows served a dual purpose: both their milk and their meat was of economic interest. The Friesian cow was top notch in that respect for a long time and was exported to all corners of the world. But since then, separate milk and beef stocks were bred. Today, Holstein-Friesians are mainly used for the production of milk. These were bred in the States from the originally Friesian cows and exported throughout the world, including back to the Netherlands. The present dairy farms in the Netherlands also mainly use Holstein-Friesians. That is one reason why the milk production per cow has increased from 5000 litres per year in 1984 to an average of approx. 8000 litres in 2014. But in addition to the hereditary qualities, it is mainly the feed of the dairy cows that has highly improved in those thirty years, making it possible to increase the milk production by approx. 60%. Up until the seventies, cows were in the pasture day and night from April until October. They were kept indoors in the winter and fed silage or hay, supplemented with mangel-wurzel (fodder beets). Nowadays, in the 21st century, only young cattle are kept at pasture day and night in the summer; cows are not outdoors anymore, or only a few hours a day. Because it is not possible to achieve a daily milk production of forty to fifty litres of milk with pasture grass alone. It requires a sophisticated diet. Corn silage and ensilage make up the basis of the diet. A laboratory analysis of the corn silage and ensilage determines which products are to be added to that, for example soy, potatoes or rapeseed; brewery spent grain, sugar beet pulp or palm kernel scraps. A mineral mixture is also added. This so-called roughage must be available to the dairy cattle day and night and changed twice a day. The remnants are fed to the youngsters and the dry dairy cows. In addition, each dairy cow is individually fed two or three types of concentrate that are geared to its daily production and the percentages of fat and protein in the animal’s milk. To that end, a number of computer-controlled feeding boxes have been installed in the barn. Each cow is recognised by the transponder around its neck or one of its legs. And so feeding dairy cattle has become pure workmanship. Most farmers milk their cows twice a day; more often if milking robots are used. Robots allow cows to be milked around the clock. On average, this happens three times per 24 hour period. This increases the milk production. But in the year 2000, the costs of a milking robot was approx. € 100,000.- and you need two robots for a hundred cows. 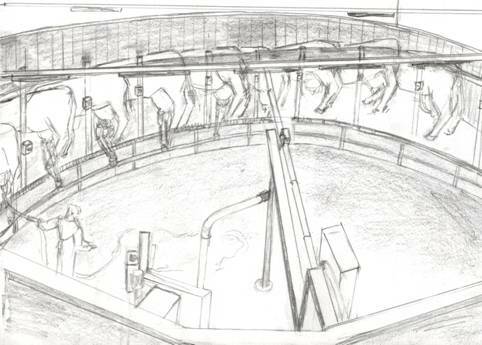 The rotary milking platform is an alternative. Twenty-eight or more cows stand on a ring-shaped platform that slowly rotates as the cows are milked. 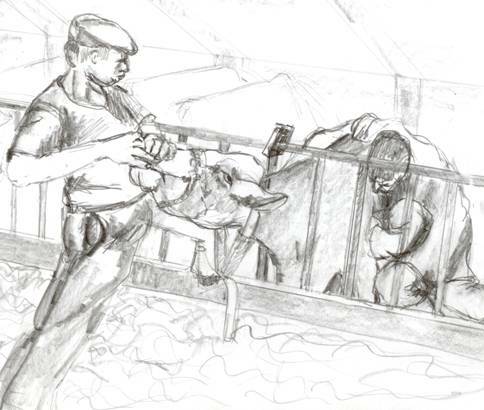 The farmer stands in the ‘milk pit’ with the udders of the cows at eye level. The production of each individual cow is measured and any deviations to the normal amount are detected. The conductivity of the milk is an indicator of an udder infection. In that case the milk is tapped off so that it does not enter the milk tank. Once the milking of a cow is finished, the animal steps off the platform and another cow takes her place. Nowadays, milking cows on a modern dairy farm involves high-tech equipment and requires major investments. A dairy farmer called the practice because the milk production of a number of cows has been too low for a few days; this had been detected by the milking machine. Other than that, they seem perfectly healthy. What is going on here? There are many reasons that may explain the situation: cows are agitated during draughtiness and they do not eat enough. Or they may not eat enough because the roughage is not quite tasty. The claw trimming may have been delayed too long, as a result of which some cows are suffering from painful feet, are inclined to lay down and eat less at the feeding railing. The supply of concentrate to the feeding boxes may stagnate if the feed computer malfunctions or if a jackscrew used for the transport of the concentrate from the silo is defective. Perhaps a silo was supplemented with the wrong type of concentrate. It sounds far-fetched, but all of these examples are from actual practice and most occurred more than once. Searching for the cause of a relatively small decrease in the milk production starts with the clinical examination of some cows, including blood and milk tests in the laboratory of the Health Service for Animals (GD). A dairy cow that does not perform to the best of its ability can be compared to a top sportsman who does not perform optimally. A few of the ‘evildoers’ are standing at the feeding railing. They were milked a half hour ago. 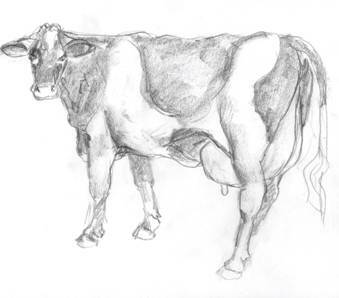 Clinical testing shows little deviations: the udders are flexible, but the lymph nodes in the groin are swollen. The orifices of the teats are callous-like. I squeeze a spout of milk from each quarter onto a black CMT test dish. It looks normal. Adding some teepol (a soap solution) makes the milk from both rear quarters slimy, meaning that the cell count in the milk is too high. Which is why I take samples for bacteriological testing. But why didn’t the milking machine spot this? It measures the conductivity of the milk which increases if the milk contains more salt. That salt content rises if the udder tissue is affected by an acute infection. But in the case of an irritation, no extra salt is secreted into the milk. The conductivity is therefore regular, whereas the cell count is increased. The milk seems to be quite normal: colour, scent and taste are un-changed. Which is why this is referred to as ‘invisible mastitis’. However, the milk production is decreased. Udder and teat irritation is usually caused by the milking machine: teat cups that are not conveniently fitting the teats, or vacuum fluctuations at the tip of the teats may be too large, making ‘suction’ on the teats too rough. The orifice becomes irritated as a result, callus is formed and the teat canal then does not properly close after milking. This enables bacteria to penetrate the udder. The laboratory cultures of the milk samples from these cows showed the presence of staphylococci (S. aureus). Dairy farmers require assistance to get their cows in top condition. 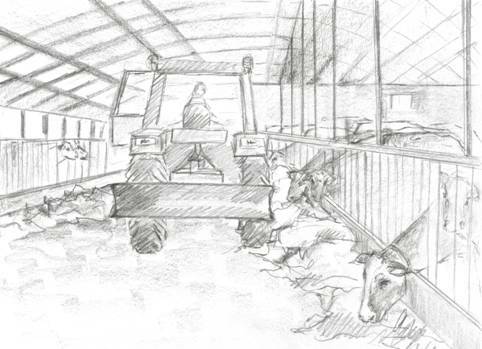 From a veterinary surgeon, the Health Service (laboratory), the feed supplier (ration calculation), the installer of the milking machine (maintenance), the dairy factory (milk inspections) and the claw trimmer. If the milk production is wavering, then the health of the cow is the key to the solution. This is ‘cow sports medicine’. Which is a huge challenge for the craftsmanship of a veterinary physician. At least, that was my experience.